Setup Install Maker creates installation setups of your computer software. 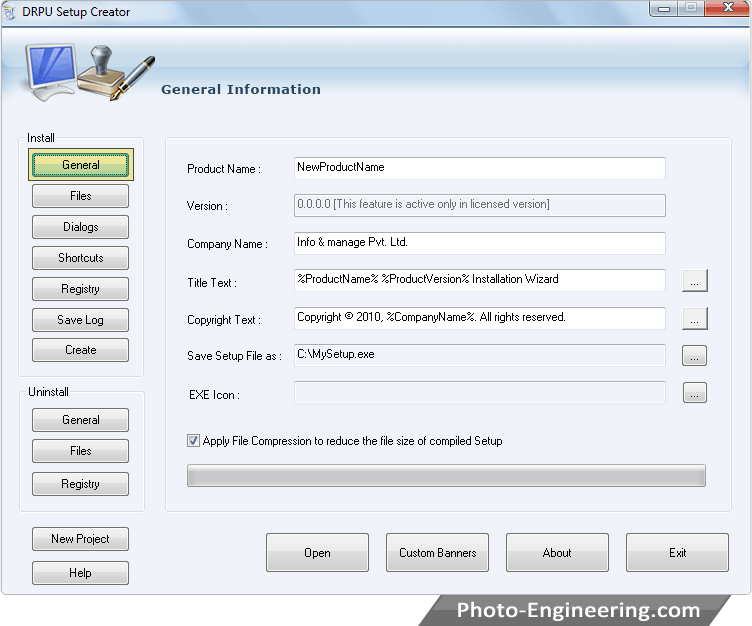 Software creates the self extracting Install and Uninstall executable file program setups. Setup builder ask you for which setup files to install and includes the Registry entries, modify Files properties, Destination path detail and other related information while creating software setup. Setup maker provides the option of including shortcut icons like the Desktop icon and generate the Uninstall entry on the Add/Remove program utility. Setup generator tool setups that are easy to save and distribute across various systems thus helping the software developers. Software setup making program creates setups for application on all windows platform without modifying the program originality. Creates Install and Uninstall setups for your windows software program. Generates the shortcut icons and Uninstall entry on Add/Remove control panel program. Saves all the entire details of your application programs for future use.